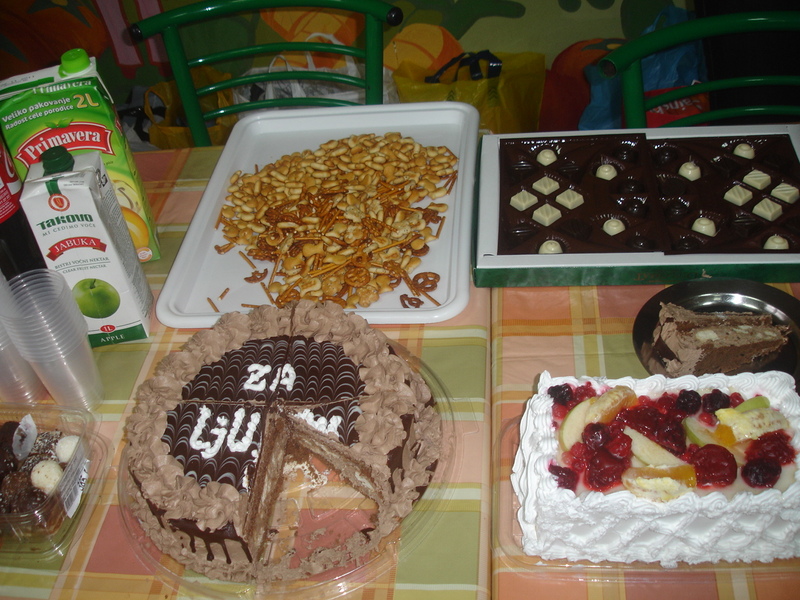 Birth day, the most wonderful day in every one’s life! We all look forward to this day and its celebration. Mohanji’s birth day on 23rd February was beautifully celebrated this year. Actually, every year, Mohanji goes to Shirdi to offer his gratitude to Sai Baba. This year due to demanding work pressures, he could not go. But it did not matter. The way our Jammu team, Mohanish, Aparna, Abhishek, Dana, Biba, Murari and many others celebrated this day will certainly make all of us think and be proud of – what are we worth???. I am sure you have read Mohanji’s message “No Flowers No Sweets”. Mohanji wants nothing from any of us. He asks for nothing. He demands nothing ever. Yet, through this devotional celebration, they have all beautifully conveyed Mohanji’s message of selfless service and his unending efforts in raising the society to higher consciousness. Here are the reports from various locations that I compiled. The Jammu Team was truly enthusiastic and selfless. They decided to have a week (Saptah) of selfless service in Jammu. 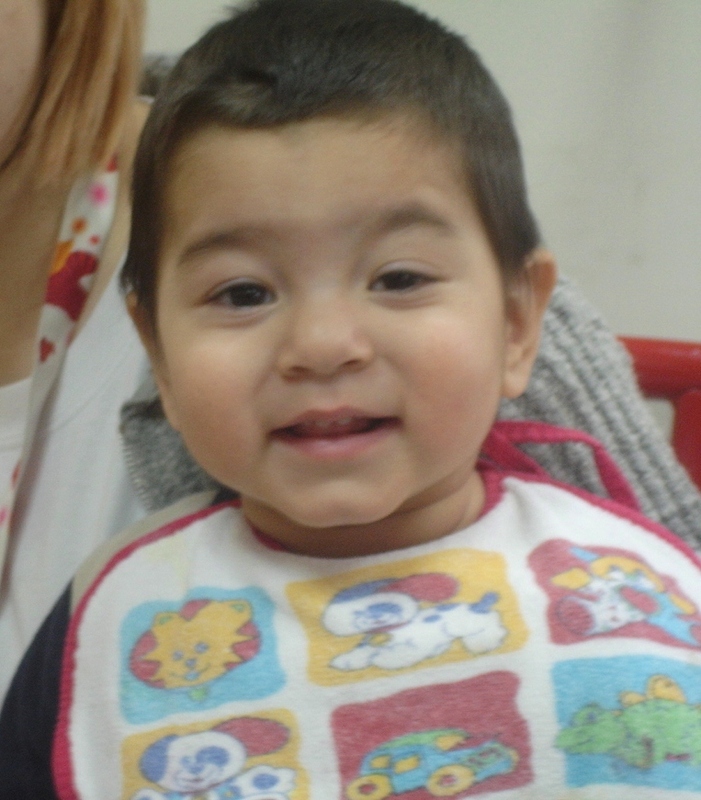 This week was from 21st Feb to 28 Feb 2011. The team also had saptah of blanket distribution in Dec 2010. We all read about it in our previous blog post. 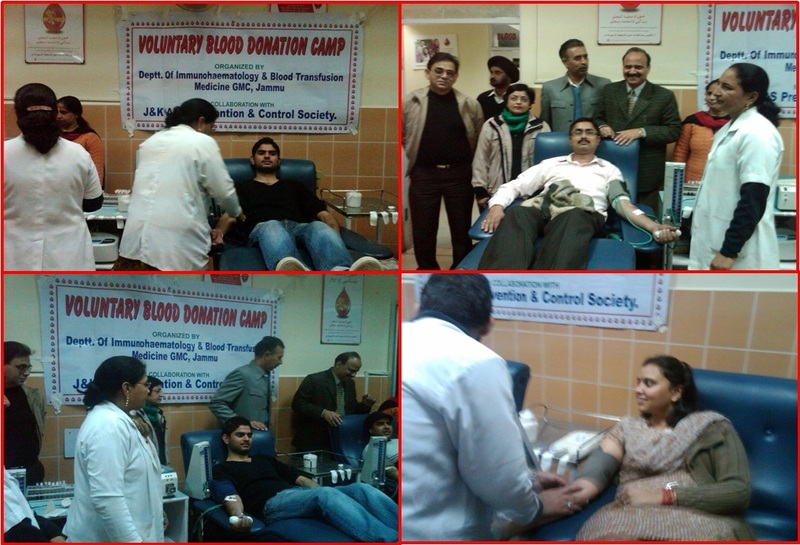 They started with blood donation for Thalassemic children in Jammu. Thalassemia is a hereditary disorder in which children suffer from anemia due to defective formation of blood. Frequent blood transfusion is extremely essential for these children. Twenty volunteers donated blood in the blood bank where 150 Thalassemic children are registered. The team also have planned an awareness program at Jammu College to sensitize young generations to donating blood for this cause. They have also decided to donate blood every 3 months for these children. Blood can never be formed artificially. It is a beautiful seva the team has done. The Smile and divine contentment on their faces while donating blood, is unmistakable. 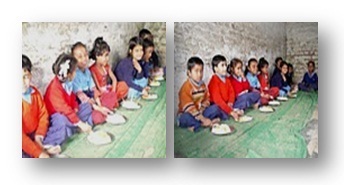 With great love, the Jammu team continued and served food in the School for the Blind, as well as for the children of laborers. They also served food in Apna Ghar, which is a home for homeless girls from the Kargil area where the Kargil war was fought. The Jammu Team humbly says, “In Father’s (Mohanji’s) honor we served them dinner”. This team did not stop here. 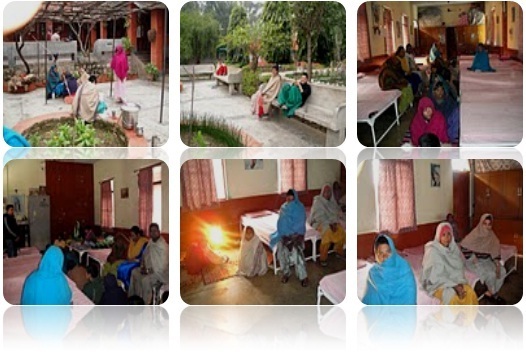 They conducted Power of Purity Meditation for women who are either mentally handicapped or are psychiatric patients staying at the Missionary of Charity in Jammu, which is an institute of our dear Mother Teresa. 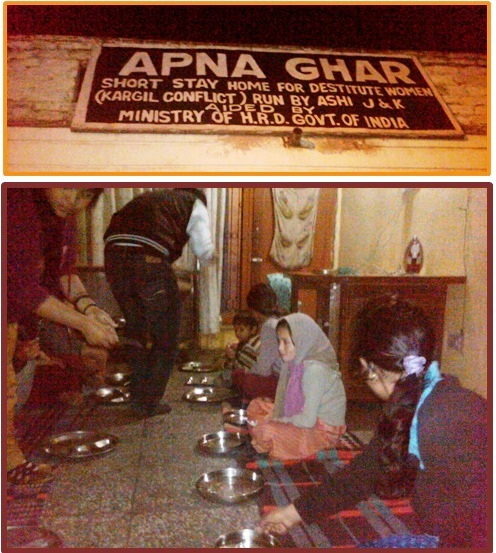 The Team also served food at Neha Ghar, which is a home for widows and their children. They also conducted meditation for children from the SOS Children’s Village in Jammu. Apart from this, this Team also serves food every Thursday to laborers. The food that they serve is fresh and hot and is prepared without onion and garlic, just the way Mohanji likes, real sattvic food. The one who prepares the food is also a very humble old person and prepares the food with love. All these acts of selfless service from our Jammu brothers and sisters overwhelm us, and also pose a BIG QUESTION MARK…WHAT ARE WE DOING FOR THE WORLD? ARE WE UNDERSTANDING Mohanji AND HIS MESSAGE AT ALL? This is the only way we can pay him back for what he gives us selflessly. He needs nothing else from us. Instead of monotonously asking him for blessings or other favors, have we ever thought of doing something for the poor and helpless in his honor? Have we understood Mohanji and his messages at all, like the Jammu team lead by Sumit Pratap Gupta has??? My brothers and sisters, IT IS TIME TO THINK, INTROSPECT and ACT. This will help our own self purification a lot. Dear Jammu Team, BTW whole heartedly congratulates you for this iconic selfless service and drive that you have shown. As Mohanji always says, “Lead by Example”. In the true sense, you are living and radiating Mohanji’s message of unconditional love. “I am thankful to SOS Village in Pune and their director Mr. N K Sharma for permission to conduct the Power of Purity Meditation on Mohanji’s birth day 23 Feb 2011. SOS is a NGO for orphans. This particular one in Pune has 200 children. They have 5 clusters with 4 houses each, sheltering 10 children in a house. Mr. Sharma is also keen on conducting it for this whole year 2011. Total 173 children, both boys and girls were present with their Mothers and other staff. The age ranged from 7 years to 17 years. I gave very little information about Mohanji and the meditation. I only said that it would be great to experience and then discuss about the meditation. I did not want to give any background as it creates expectations. We started with OM, humming which was followed by 1,2,3 – 1,2 breaths. It was extremely difficult to manage the rhythm of so many! But the children were pretty disciplined, obedient and cute. Seeing such a big number of children, I was doubtful if I would be able to finish giving shaktipat in time. But, As Always, Guidance Just Happens!! The CD was played. I offered gratitude to Mohanji and surrendered completely; even each breath of mine was His. I started delivering the sacred shaktipat with 2 kids simultaneously. When I finished about 15 or 20, I telepathically said to Mohanji that logically it is impossible to finish 173 in 40 minutes, that too single-handedly. Then He held my spine, and jerked my consciousness. I immediately felt the sudden movement. His crystal clear message came instantly, “Don’t worry. I have increased your intensity.” All the people whom Mohanji has initiated for Shaktipat and are sincerely delivering it, will definitely know what I am talking about, even though others may think it as impossibility. I said ok. From then on it was pretty quick. Still a large number were left and the meditation track was nearing its end. I expressed the same doubt. This time He asked me to give shaktipat to each individual after the track was over. Just like how He gives it to us. In all the sessions that Mohanji conducts, usually we form a line and go to Him individually for receiving shaktipat. I became totally relaxed. What was there to worry about? Post meditation, I asked those who did not receive shaktipat to form a line. I seated myself on a chair next to Mohanji’s photo. I made sure I was able to see into His eyes. Then one by one, each came to me. I was having intense headache. But it couldn’t be termed as ‘pain’. I knew for sure that what headache I was getting was actually happening for Mohanji. The pain was just going through me to Him. I was guided to give the shaktipat in details!! The guidance was perfect and I clearly knew how much to deliver to each!!! WOW what an experience! Everything was about to finish. Another doubt occurred in my mind!!! 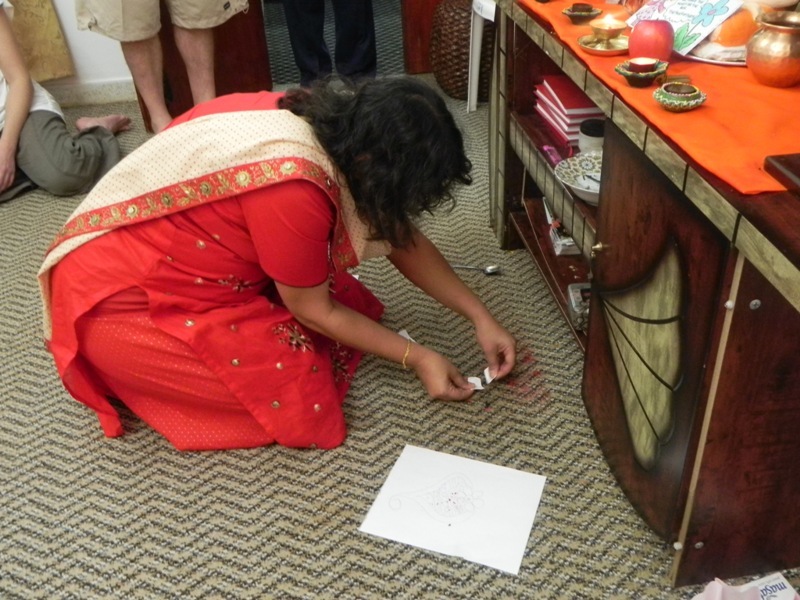 Out of the 3 lamps (diyas), one went off during the meditation and 2 were left. But, astonishingly, those two continued to burn even till the last child. The last child walked up to me. With closed eyes I was just serving. Just when I lifted my hand off his Sahasrara the two diyas went off!!! PICTURE PERFECT! And this happening was noted by Phalke uncle, a couple of others and the counselor! Thus, I understood yet another fact about Mohanji’s stature! When asked about how it was, the children exclaimed joyful appreciation and said they would love to have more! The teachers were happy too. The counselor was suffering from headache and cold since morning. She said everything was gone and she felt completely cured!. I would like to thank Mr. Narayan Rao Phalke and Amol Mali. Phalke uncle for arranging the samaii and diyas (lamps) and also for their help in maintaining decorum in the hall. Amol Mali supported both of us. I also thank our dear brother Abhishek Mehrotra for making this opportunity available. He says, “On the special occasion of Mohanji’s birth day, I was extremely glad to conduct the Power of Purity Meditation with 18 HIV positive children at Sohna. Not only did they enjoy the cake & gifts, but they also experienced deep silence during the meditation. Most of them had profound experiences, which was difficult for them to describe. Abhishek, all BTW family members extend their heartfelt thanks to you for your genuine efforts to contact SOS village and initiating meditation for orphans. We are also thankful to you for conducting meditation for HIV affected kids which will certainly aid their healing. Murari has an entirely different agenda than all of us and needs a special mention. He feeds birds and animals. 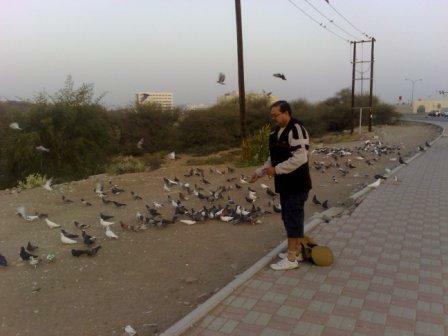 After office hours, he walks on the street and feeds all the birds and animals he crosses on his way. What a lovely gesture! Mohanji says, “Feed birds and animals. When we feed them, Baba feels happy.” Murari is doing another great thing. He has stopped giving any materialistic presents to anyone. He gives a plant as a present. What a beautiful seva for Mother Earth! He literally lives Mohanji’s teachings ever since he met Mohanji. Apart from this, Dana conducted meditation in Gurgaon and Aparna conducted meditation in Chandigarh. 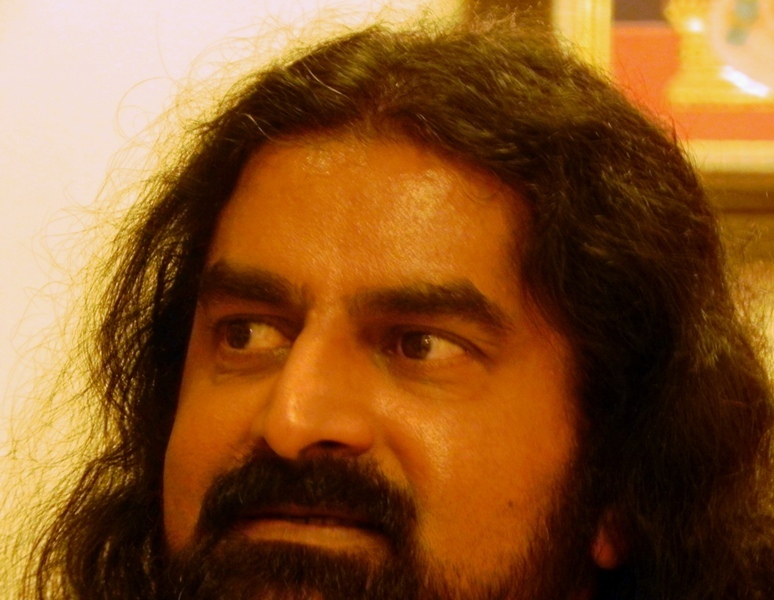 Mohanish also conducted two more meditations in Pune this week. Jayant Ganapathiraju from the US has put in tremendous efforts to renovate the Ammucare website; http://ammucare.org/ and it was released on 23rd Feb 2011. Also our dear family member from Germany has compiled and edited various verbal and non-verbal communications of Mohanji. These will soon be released in the form of a book called “The Power of Purity”. This compilation will be the first book ever to be published about Mohanji. The publishing contract was signed on the 23rd of February and the book will be published before June 2011. Thanks also to Dr. Sanjay Jaju from Muscat for his efforts in this project. Mohanji has written 46 blogs till now giving us in-depth understanding of life and our grand tradition. These blogs are getting translated into Hindi. Mohit Kandhari from Jammu and Vinay Jha from Delhi have made this possible. Dear all, many others have done so many selfless acts. Many chose not to disclose theirs. Some have decided to win over some of their conditionings and habits. Some have donated money for Ammucare Charitable Trust activities. The BTW Family extends deep gratitude towards all. Birth day is the day we came back to the earth. Our souls knows exactly what we came to earth for. But, as we grow and get caught up in the routine and conditionings, we unfortunately forget what we came here for. Then the search begins. We get carried away with the selfish motives and many attractions of this world. We forget simple things like unconditional love, faith, surrender, dharma, selfless service etc. But, all the above-mentioned expressions from our beloved family members indicate that unconditional love and selflessness do indeed exist. The key to happiness is helping others! “I will be happier, when you feed a hungry dog or a bird that represents detachment because it never hoards or stores anything. 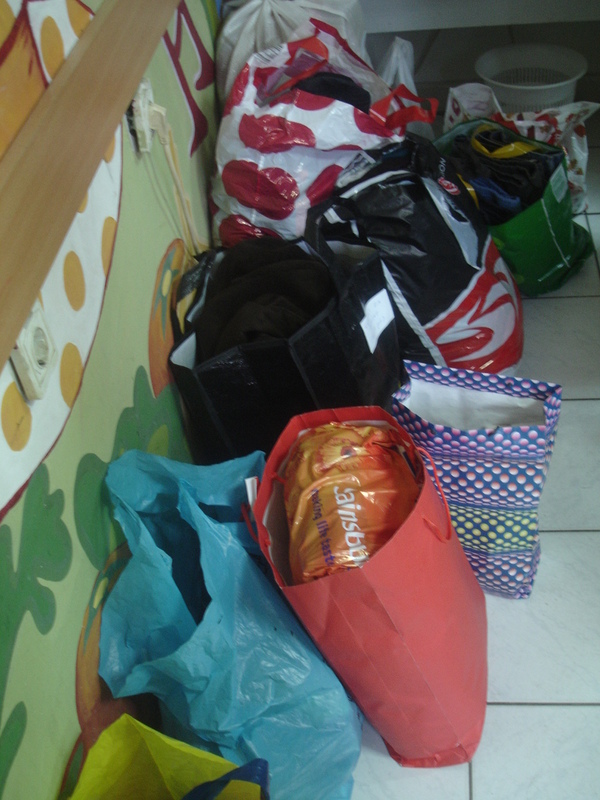 Clothes to the poor and needy, food to the hungry, shelter to the homeless. If you consistently and honestly express deep compassion to your fellow beings, I feel genuinely happy. This is the communication that I like. This makes me feel happy and rich within. When you do such good deeds, please inspire others also. Let this become a movement. Let this become spontaneous. 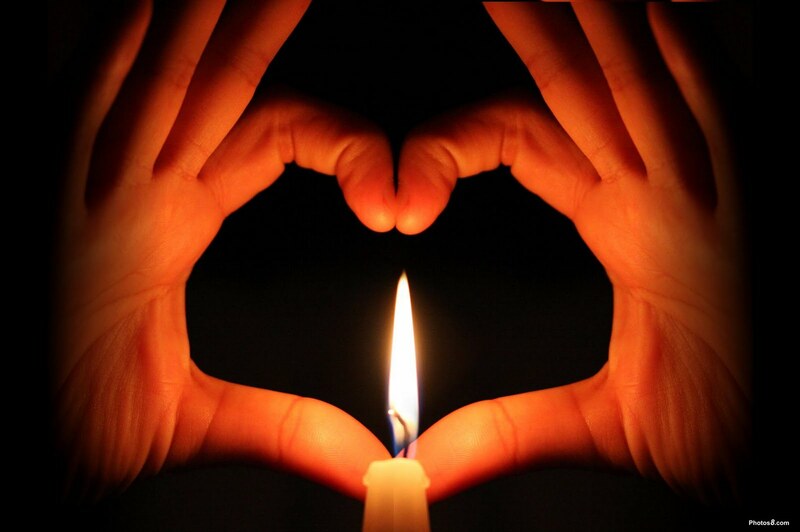 Let hearts swell with love and compassion. Me and Mine should melt, wither away and become ours and everybody’s. Selflessness should become your very nature. Nothing else makes me truly happy”. These are few of the happenings on his birthday. It should not stop here. Let’s keep this ball of selflessness rolling. Let more be benefited. Let this inspire others. Let more join. If I get good clothes and food three times a day, then even others deserve the same. Follow your Heart, serve All! We surrender all activities at Mohanji’s lotus feet. BTW Serbia – All FOR LOVE! 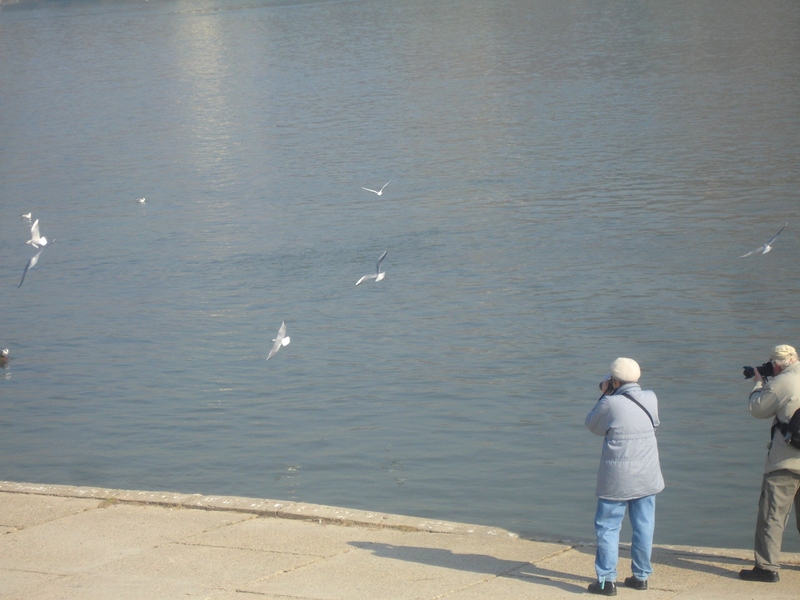 It just so happened that on the very day of my arrival to Belgrade, Serbia (Feb 3rd), Marija was conducting the Power of Purity meditation in Belgrade. I was deeply touched by the pure energy of the meditation venue, amazing group energy (there were 15+ meditators who did the intro breathing with a 100% perfect syncronisation) and humbleness of Toma, the owner of the apartment (who arrived late and spent 30 min. in front of his own door, in the freezing cold weather, in order not to disturb the meditation). I’ve never seen such piety and was literally speechless! Last three Thursdays were marked by 3 truly wonderful Power of Purity meditations in Novi Sad, at our regular venue – the Homeopathy Centre on the Boulevard of Liberation (amazing how Masters take care even of the minutest details such as this street name – perfect for the Path of Pathlessness) :-). 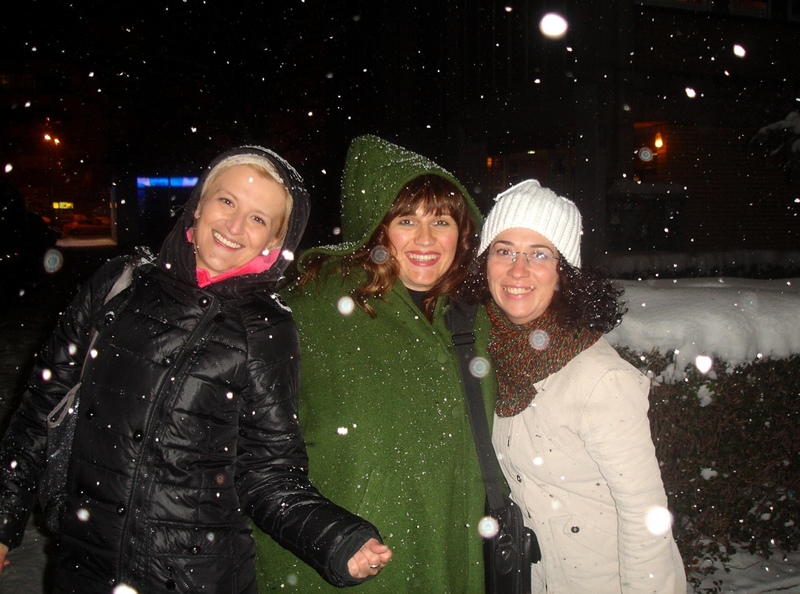 Ceca, Biba & Klara - The post-BTW bliss, snowflakes and orbs! 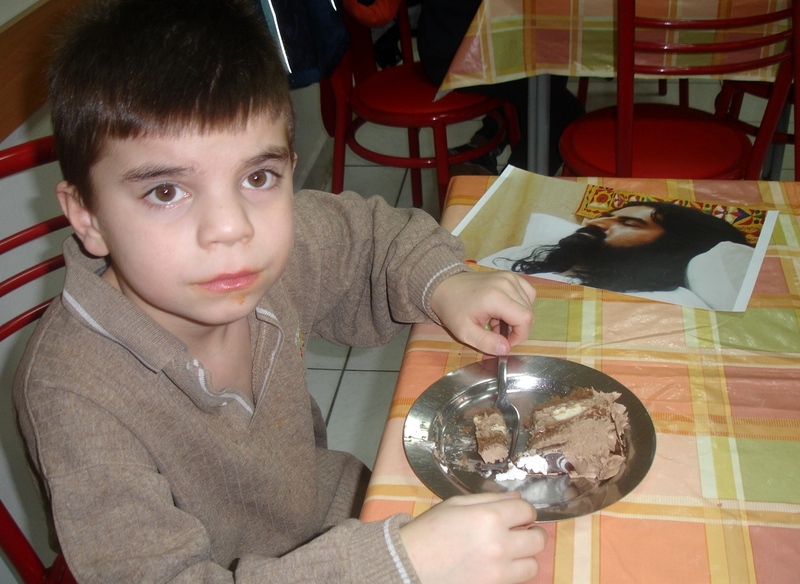 What really filled me with great joy was the first ever ACT Seva activity in Serbia – conducted at the Shelter for Abandoned Children called ‘The Safe House’ on Mohanji’s birthday, Feb 23rd. It miraculously happened irregardless of the weather conditions, transportation problems and people’s busy schedules. During the last week’s meditation, I announced this event, explained about the tenets of the Ammucare Charitable Trust (ACT) and how there is no better way of celebrating Mohanji’s birthday than through expressing Unconditional Love and serving the helpless. I would like to thank all those who donated the funds for this Seva, but especially our amazing Bilja, Klara, Spomenka, Hana & Marijana (as well as my Dad! ), who made it a point to join me at the Safe House personally, no matter what. "Can I keep this photo...?" 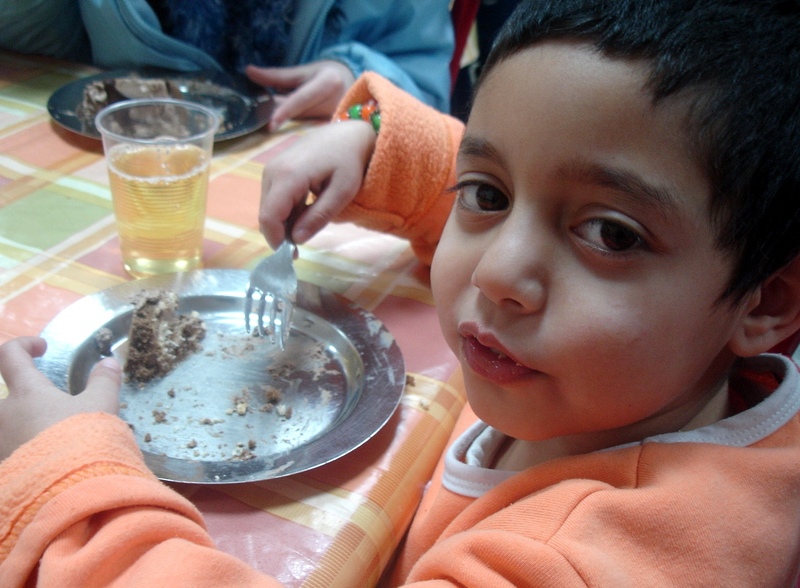 The joy I felt while watching these children eat their cake so innocently was indescribable. One of them had a very short haircut which made me mistake her for a boy. She looked at me and replied confidently: “I am a girl.” I apologized immediately and felt like hugging her when I saw those big, sad eyes. 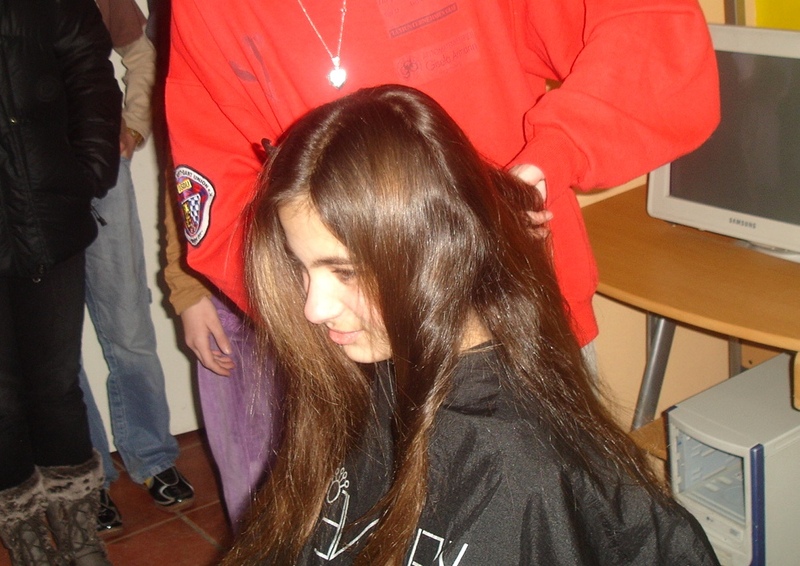 There was another excitement that we had in store for the children – Marijana, one of the renowned hair dressers in Novi Sad, offered to do free hair cuts/styling for the Safe House children. After the cake part was over, we went to another room and this new adventure started. At first, children were shy to do it. Finally, one boy agreed to be the first one. The others were watching carefully, curious to see how their friend will end up looking with this new hairstyle. 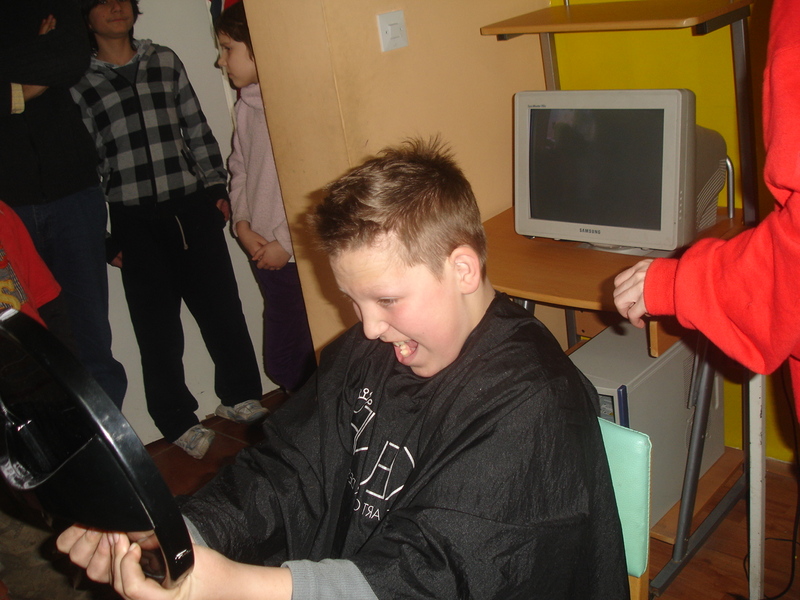 When Marijana was done with him, he couldn’t believe his eyes 🙂 – he was so excited to see his new, COOL hairstyle that he literally screamed out of joy! Whoa! I look SO COOL! At this point, other children got very excited and finding another one to agree to have a haircut was definitely no longer a problem. “Avatars always happen for a universal purpose – a magnanimous, self-less purpose. Annihilation of evil and preservation of dharma is usually the sole purpose of all avatars. When an avatar takes birth, the whole universe, and especially the higher beings existing at various locations of the universe, configure to aid the avatar to accomplish its mission. It is usual that many high souls, who are not usually earth bound, decide to take form on earth, to assist the avatar. When the universe configured to create Lord Rama, with the amsa and power of Lord Vishnu, many souls who participated in that grand decision decided to come forth and aid the avatar. Lord Hanuman is one of them. A powerful entity with the highest of all siddhis (Ashta Siddhis and Nava Nidhis), assumed the role of a devotee of Rama and took physical form to assist Rama in his mission and to teach the world that the greatest of might becomes extremely effective if surrendered to the higher will of the Supreme Lord, which Lord Rama represented. When an extraterrestrial strength is transformed into supreme devotion, it instantly induces a liberated existence. Usually, superior strength leads to superior ego. This is what we see in our everyday life. 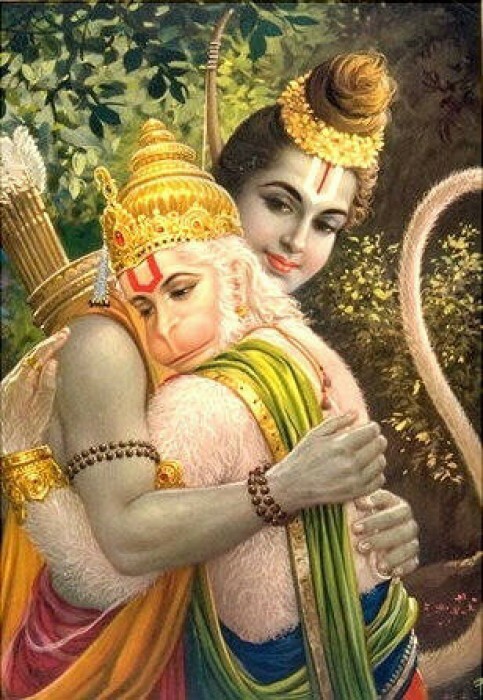 In Hanumanji’s case, he became invincible due to His surrender and devotion to Rama, the Para Brahma. He guides us to surrender our ego at the feet of the Lord and lead an existence of complete surrender and faith. He is eternal in His body. 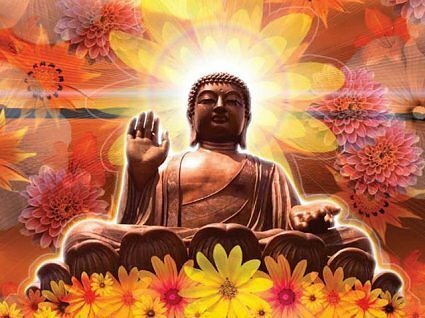 He decided to stay on in the terrestrial plane, unaffected by maya, to bless, guide and protect lesser beings into the path of supreme liberation. 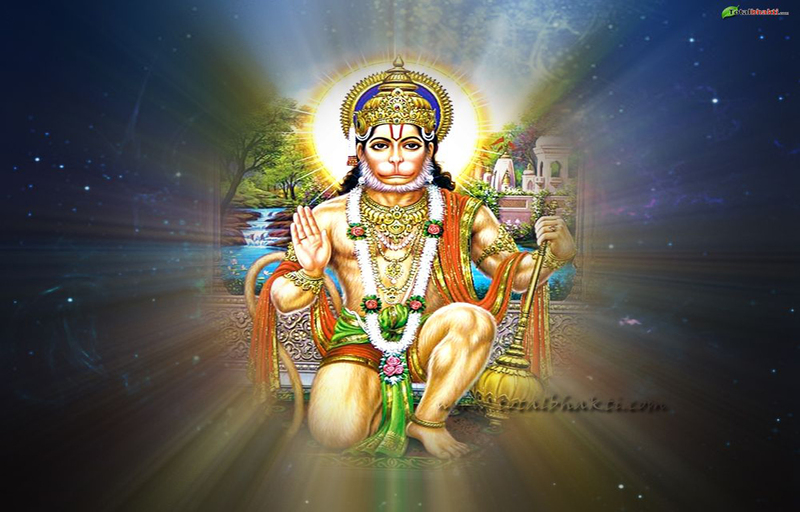 He is a great Siddha, a Great Master, yet he assumed the form of a monkey so that he would be ignored and left alone. This was also part of the divine design of Rama Avatar. ” Mohanji. My happiness knows no bounds as I am sharing these great blessings of Hanumanji with all of you. The first time I heard his spontaneous Sanskrit chants in the Vashishtha cave, I was paralyzed by the sheer power of it. Abhishek Mehrotra was also with us on that occasion. I am sure he would vouch for it too. 🙂 (more details about this divine journey to the Vashishtha cave and Mohanji’s third eye shining in purple can be found at this link: https://mohanjichronicles.wordpress.com/2010/09/17/divine-journey-with-mohanji-part-1/). Please keep in mind that Mohanji has neither learned Sanskrit, nor has he learned any scriptures or mantras. All that he chants is spontaneous, without any preparation or pre-planning. People from different parts of the world who feel connected with Mohanji have been continuously expressing their wish to hear some chants sung in Mohanji’s deep, heart-melting, penetrating voice. Therefore, a few of us in Muscat (where Mohanji lives) thought of making it happen. 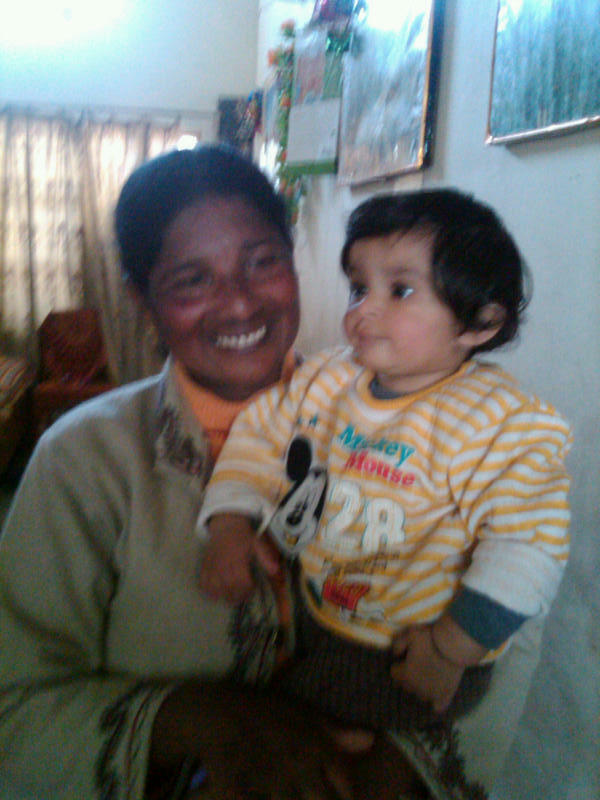 On Friday 11 Feb 2011, on my daughter Moushami’s birthday, we organized the recording of chants at Mohanji’s residence. Balakrishnan and Pramod, who are singers, joined us for the recording since chorus members were needed for some of the chants. Robert D’Souza, who is an excellent guitar player and a graduate from the Los Angeles Music School, recorded the chants with his high-tech music recording system. Little Moushami also participated in the chorus. Sanjay, Caroline and Peter were there to help out as well. There was no great preparation, and definitely no proper studio. We started this with minimal preparation and facilities. The only aim was to record divine chants in Mohanji’s voice. Visibly BLISSED OUT!!! The post recording lunch!!! We started the recording with Mohanji chanting AUM and continued with Ganesh Stotra (it is customary in India to worship Lord Ganesha, remover of obstacles, before any function). We especially recorded the chants that represent Ganesha as the Supreme Lord Parabrahma, which Mohanji likes a lot. Although we decided upon a particular sequence in advance, Divinity had its own plan (which probably only Mohanji knew). Mohanji sang 22 different chants in a single stretch with only 1 or 2 retakes. The chants included Gayatri Mantra, Guru Vandana, Maha Lakshmi ashtakam (Praising Goddess Lakshmi) and many more. This recording took a mere hour and a half! It was truly amazing. He then continued with the recording of “Bramha Murari surarchit lingam“…, which, as you may know, is a famous and powerful chant on Shiva. Sanskrit chants were simply flowing through him. It did not appear that he was chanting. Words were happening through him. The energy in the room had completely changed. The chants in Mohanji’s voice created a truly powerful positive energy in the room. All were in a kind of trance. A very high, ecstatic and elated state. Energy measured by the consistent intensity of the flame!!! We took a 5 minute break. Mohanji then said: “Ok, we will now record the Hanuman Chalisa.” We were all set. Initially there was some disturbance in his throat. He coughed, drank water, and started again. Mohanji started reciting the Hanuman Chalisas spontaneously, without referring to any book. He asked that the flow should not be disturbed as he wanted to record it in one stretch. He closed his eyes and chanted in a seeming trance!!! The power with which he started Chalisa provoked another big energy shift in the room. The whole energy of the room was taken to a much higher level. It was a tremendous energy indeed!!! The flames of the lamps at the altar were unusually high. Moushami and I simultaneously observed that it actually burnt the lamp’s aluminum cover (please see the below photo). The lamp’s cover usually never gets burnt and remains in its original silver/red color even after the wax is consumed. 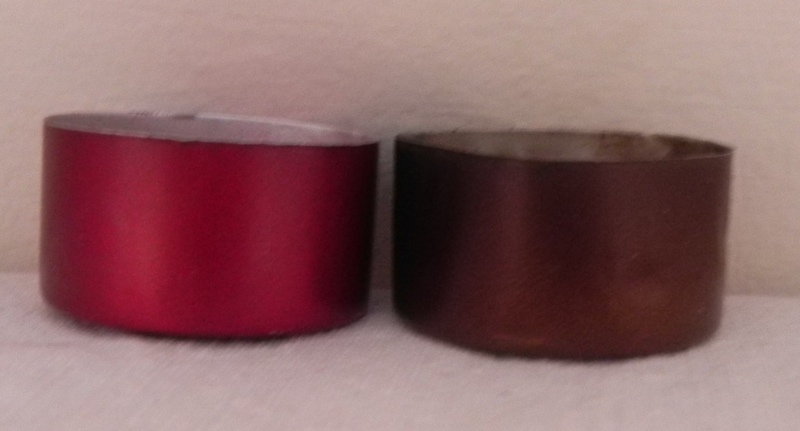 Effects of the Higher vibrations of Spiritual energy...Burnt Candle cups!!!! All of us present felt the surge in energy and were merging with his voice and power. 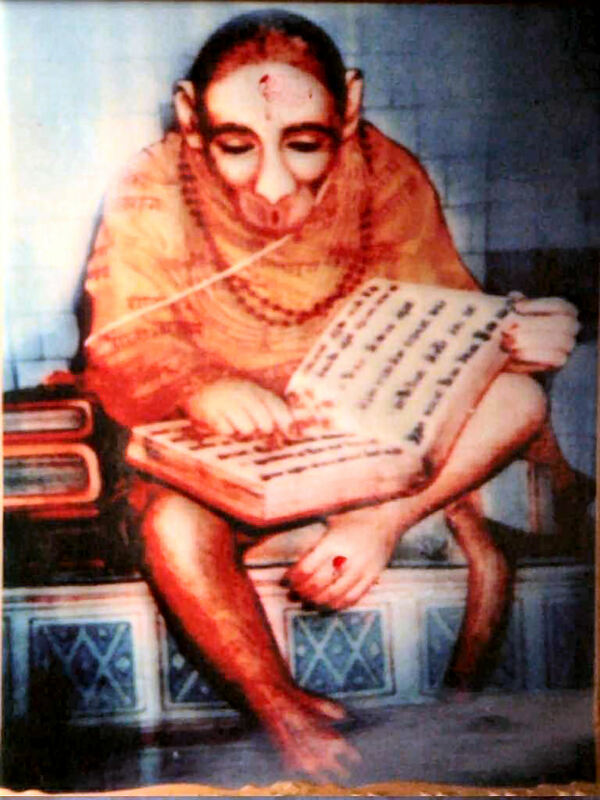 In one smooth go he finished reciting and the Hanuman Chalisa was recorded. There were no variations at all; everything was synchronized – the scale, pitch, tune, words, pronunciation… everything! There was no disturbance from cars passing by on the road, or from any other noise. As he completed the chanting, He bowed down deeply to Hanumanji, as if He was standing in front of Him. We were surprised that he knew the chants by heart! Furthermore, his Sanskrit diction also seemed perfect. We were all amazed. We could do nothing but simply remain silent. We just kept looking at him and the altar of the Masters, alternatively. With every chant his voice was becoming more deep and more divine! As soon as Mohanji finished reciting the Chalisa, Bala bowed down to him, touched Mohanji’s feet and said: “I saw Hanumanji in you today!!!”. He also showed the Hanuman Chalisa book, which was surprisingly present in his pocket. Readers, please understand that this whole recording was extempore. Mohanji never practiced or rehearsed anything. He has no time. He is so busy working in the office during the day and then devotedly solving our problems in the evenings. Bala, Pramod and Robert also did not know the plan and schedule of that day, nor which mantras were to be recorded in Mohanji’s voice. The same is true for everyone who gathered there last Friday. Nobody was told anything and nobody knew. The whole event was spontaneous!!!! After reciting the Chalisa, we decided to have lunch. Everyone was hungry. All were having an informal discussion about the recording while I went to the kitchen to check on the food. Mohanji has this picture of Hanumanji in his bedroom Altar..
Moushami, naughty as usual, noticed red kumkum powder sprinkled on the carpet in front of the altar. There is no KumKum anywhere near the altar, otherwise. So, where did this come from?!!! She almost screamed, calling me: “Mama, what is this kumkum?” I came running and saw… it was not red but ORANGE colored powder, which is usually used only for the worship of Hanumanji!!! I humbly said: “Moushami, this is the sign of Hanumanji. Hanumanji actually came here and was with us during the recording. He gave blessings to all of us, and left this sindur (shendur, orange saffron powder) as a sign of His presence! He left this proof for us to know!! !” Everyone got up at once excitedly. Everyone except Mohanji. He continued to sit in his chair with his usual knowing, naughty smile. We then understood to whom Mohanji was bowing down after the chant! He had bowed down with full reverence and gratitude to the Great Hanumanji Himself, as if it was some kind of a ceremony, or pooja, not a recording session.!!! All of us applied the sindoor on our third eye. For Moushami, this was a real divine Birthday Gift!!! What more can we ask for?!! Deepali gathering the Kumkum from the carpet.. What a Grace and Blessing!!! Hanumanji is an icon of supreme devotion, surrender, faith, purity, intelligence, power, penance and compassion. His grand presence is unmistakable in the famous epic Ramayana. He helped Lord Rama to rescue Mata Sita from the demon Ravana. Hanuman Chalisa is sung in His praise. It is supposed to help one overcome all the obstacles of life as well as protect one from all the calamities. 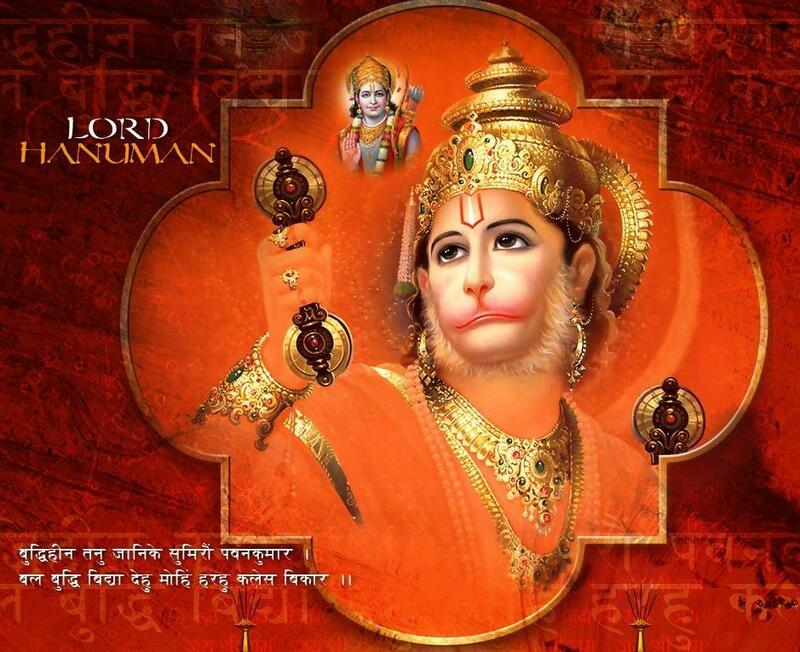 Mohanji’s power in reciting Hanuman Chalisa unmistakably invoked Lord Hanumanji’s presence! 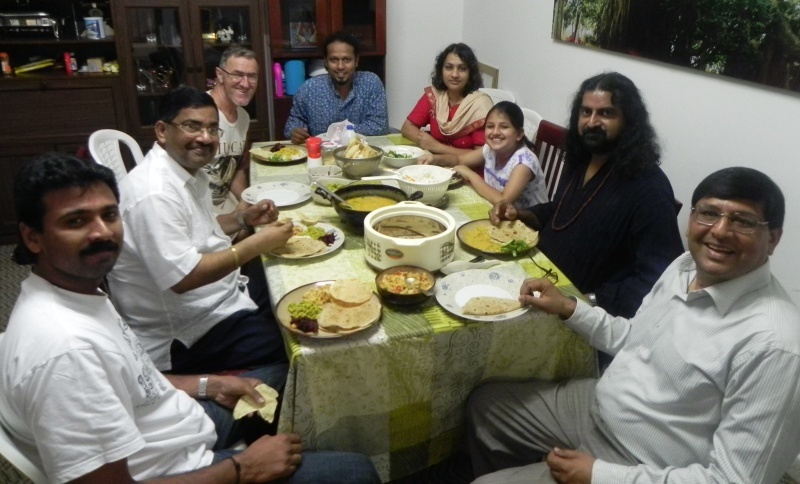 We were a total of 8 people in the room (a total of 10 in the house), including Mohanji. All witnessed the appearance of this saffron powder from nowhere! 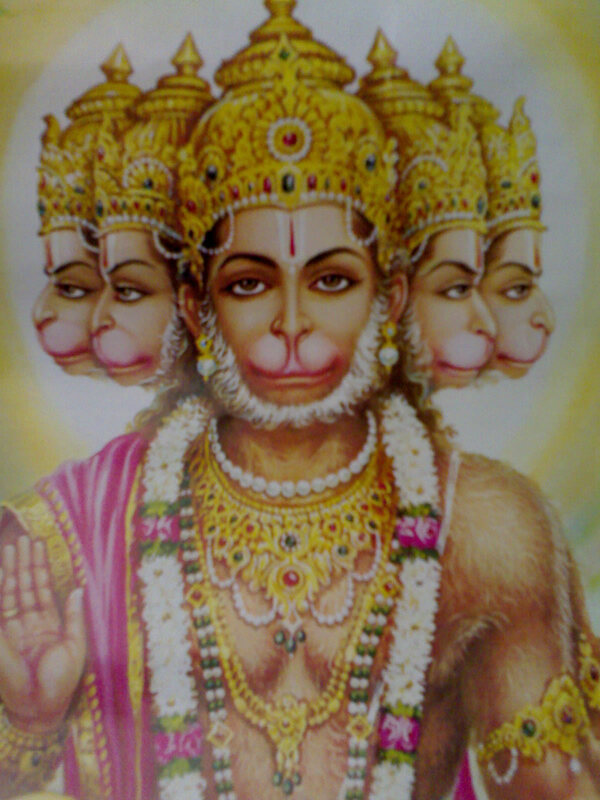 Pramod, Sanjay and Bala are all devotees of Lord Hanuman and have been worshiping Him for many years now. Pramod has been visiting the Hanuman temple in his hometown in Kerala for the last 25 years. Pramod was so shaken with this divine experience that he was unable to stand on his feet for some time. He just became silent, as if in trance. 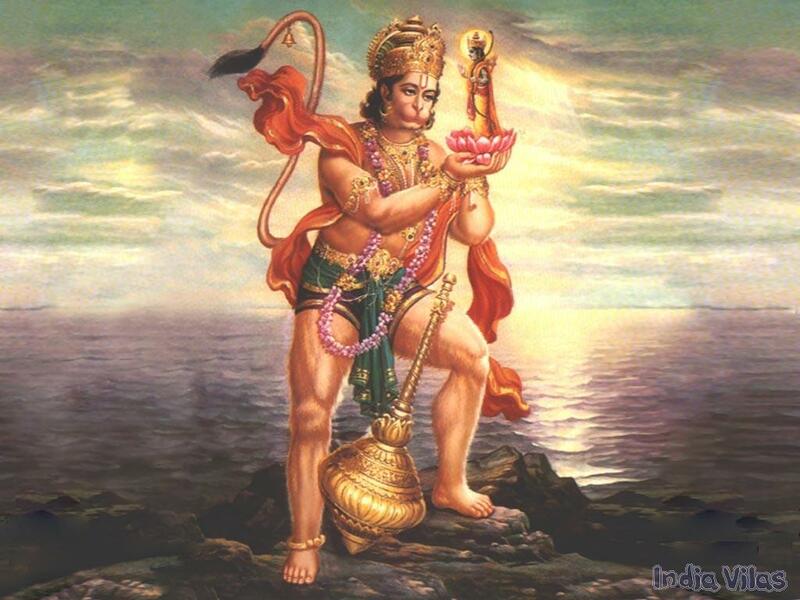 Because of Mohanji, all of us were able to partake in the mighty presence of Lord Hanuman. Mohanji answered everyone’s prayers. I am totally convinced that there is not a single moment that Mohanji spends on earth, that is without any purpose. All thoughts, words and actions of Mohanji are purposeful, even though it may all seem ordinary because he is completely unpretentious and unassuming. Just a day before this event, our friend G.I. had met with an astrologer. While discussing about Mohanji, the astrologer, who has never met Mohanji, told our friend G.I. : “He is powerful. He has the power to invite and manifest any Gods, if he wants to. But, he will hardly display it!” Now we saw that it is real. He indeed has the power!!! Dear friends, Bade Baba and Sai Baba physically appeared in front of us. You have already read our Ganeshpuri experience (https://mohanjichronicles.wordpress.com/2010/11/03/a-birthday-in-ganeshpuri/). So many other miracles are happening everyday. It is often overwhelming. Many people are experiencing Mohanji’s physical presence in many places, while he is physically stationed here in Muscat. At least now, we hope to understand Mohanji’s stature, even though it is never easy. In this spiritual journey, many more miracles will happen. We cannot stop at these miracles. We cannot hold on to any miracles. Miracles are just random expressions of the powerful stature of a Master. They only serve as reminders to the followers. We need to move ahead. There is a lot to come, and there is a lot we must do for humanity. Also, each one has their own unique journey with a definite purpose. Please do make your own journey. Don’t look around, just walk with deep faith and devotion like Hanumanji and enjoy your walk to freedom. The few photos featured in this blog are provided as proof of this Divine experience. Their purpose though is not to serve as witness, but to bless you all. These chants and Chalisa will soon be available in a CD format. Robert is also adding the music to it. Mohanji told Robert to use music that he would be spontaneously inspired by. “No pre-planning Robert. Just do it”, said Mohanji. That is the way spirituality works. Just Be. May all of you experience the power of his chants. The graceful presence of Hanumanji during the recording of the Hanuman Chalisa continued with His subsequent blessings while Robert was adding music to the audio recording of the Hanuman Chalisa. Here is a small story about an occurrence of information technology failure and the miraculous preservation of the chants recorded by Mohanji. This gave me a shiver of uncertainty. We had recorded more than 22 chants. There were additional chants, including the Mahishasura Mardini Stotram, the 108 Names of Lord Dattatreya, and many more devotional prayers and bhajans (spiritual songs) in Mohanji’s voice. The crash of the laptop was indeed a disaster. By now Mohanji has made so many transformations in me that I did not shake with this news. I coolly asked him, “What happened to the recording of all the chants in Mohanji’s voice?” I knew I was selfish in asking this. Everyone’s projects have equal importance. But this was a divine work. Asking Mohanji to chant all again was not possible. 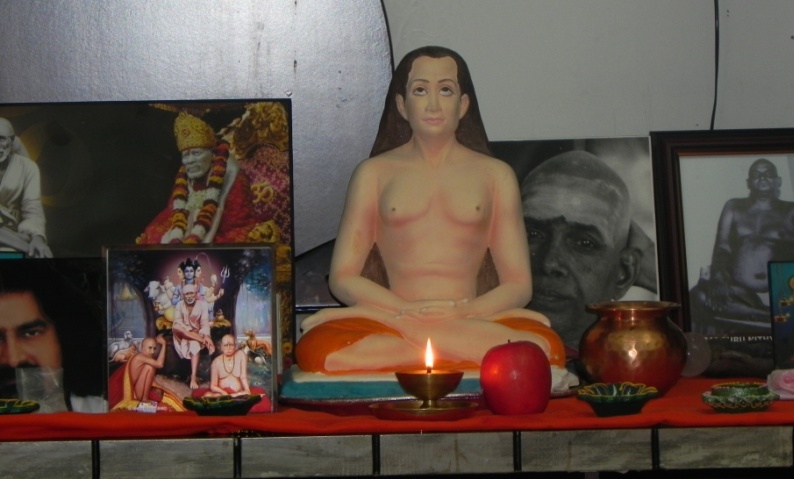 When he chants, he invokes the presence of Masters and deities. His chants are reflected in other dimensions. Losing this work meant a lot to me. But Robert’s answers gave sparkles. He said, “Dr. Deepali, I was able to recover all of Mohanji’s files! They did not disappear and were unharmed despite this crash; though I almost lost everything else. I have to start all over again, to get and install softwares!” My heart went out to him and I really felt sorry for Robert’s loss. We met later and saved copy of all of the chants recorded in Mohanji’s voice as well as other projects on another hard disk. Dear all, I would like to remind you of the very important aspect that TECHNOLOGY WILL FAIL, BUT GRACE WILL NEVER FAIL. Hanumanji’s blessings continued to flow. Without that, Mohanji’s chants would not have been preserved in this laptop crash. This incident has made me more humble. I have developed even more reverence towards Mohanji. I also sincerely wish all the best to Robert to revive his work at the earliest. The Power of Purity Meditation arrives in Chandigarh! Spiritual Union in the Union Territory of Chandigarh! The Power of Purity Meditation arrived in Chandigarh! 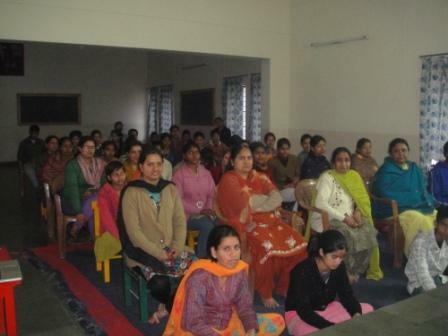 Sumit from Jammu conducted meditation on 30th January 2011 in Chandigarh, a capital of two states of India – Punjab and Haryana. 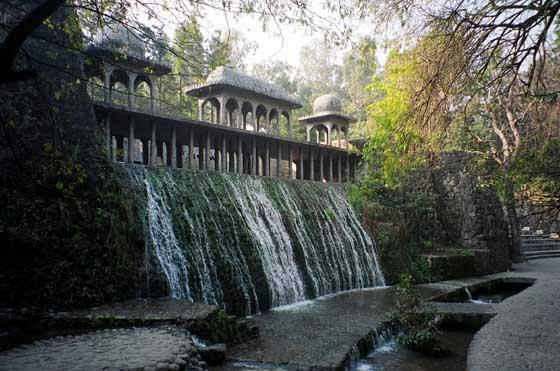 Chandigarh is a beautiful city blessed with nature and known for its architectural excellence. Meditation was conducted at Ms. Aprana Sharma’s place. The turnout was so great that they had to conduct two consecutive sessions to accommodate all! This program was an excellent example of how sincere sadhaks (spiritual seekers) are guided by Masters to conduct and attend the meditation, and how Their pull works at the soul level, and the soul drives the body to attend! “Guidance does happen!” All in all, those who deserved to attend, were beautifully and spontaneously guided by Baba/Masters to attend the meditation. Even though Mohanji was in Muscat, Oman, while this meditation was conducted, people who had never met him before physically, felt and experienced his physical presence in Chandigarh!!! They felt his actual physical hand on their head! They distinctly saw large energy field around Sumit when he was talking to them!!! They were relieved of deep-bound emotions related to past traumas and the meditation gave them deeper understanding of non-duality, love and oneness with the Master. Through this meditation, many questions were answered and clarity happened spontaneously. Blockages were removed. People were reassured that their path to spiritual progress is right. By the grace of Mohanji, people found their own Guru. Each one was given what they needed. Mohanji has been giving understanding of life through his blogs for years without expectations. www.mohanji.org. If you have been reading Mohanji’s other blogs, you will realize that, Mohanji delivers what he writes/says/ promises. 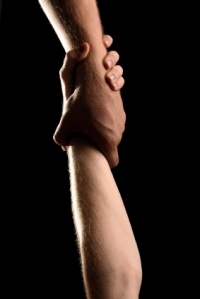 These experiences also clearly demonstrate the supreme power of surrender and faith. We are sharing here a few unedited experiences of those who attended the meditation, with their consent. These are not experiences based on mere imagination or daydreams, but real happenings which have cleared the inner space of respective meditators of immensely burdening, deeply rooted emotions, and have now settled them in a different plane of lighter existence and clarity. The clarity, purity and spontaneity of their expressions vouch for their inner peace, tranquility and settlement. As you read, you may realize what I mean. Experiences are unique for each individual and reading others’ experiences may create bias – please keep this in mind as you read. Mohanji is a mirror. You yourself reflect in that mirror. Mohanji could be understood through these tangible experiences. All these and many other such experiences through him make our understanding about him complete. BTW expresses sincere love and gratitude to Aparna, Sumit and all those who made this possible and attended, as well as to all those who shared their experiences. We had Power of Purity meditation in Chandigarh on 30th January 2011 and Sumit who came from Jammu gave Shaktipaat. The first month of the 11th year, the first time in Punjab, the first encounter with meditation for some; but experiences were as eternal and as ancient as ever. No words to describe the experiences!!!…. no words at all. Like a freshly created being waking up on the first morning upon the earth, when nothing had a name, nothing had a story- like that first being facing its first sunrise having no words to explain the love!!! My own experience combined the outer, physical life with the inner life. No dichotomy. It started with Sumit giving me a go-ahead to invite more guests as he was willing to do more than one session back to back over the day. And here I am in Chandigarh, knowing nobody who knows Mohanji or would be interested in any sort of a meditation at all. My only friends are my work colleagues and my Buddhist friends. People, who attend various meditations and healing workshops, gave me a very lukewarm response, while people I hadn’t remembered in years or never known at all, started emerging! I could feel the Master’s pull so tangibly. From there on, I knew that it was HIS meditation, HIS work, HIS grace. J So I stopped worrying at all. He pulled so many people like a magnet, some of whom I had never met in life. And how do I even write this?? — I KNEW IT!!!!! I simply KNEW it. In my very first Shaktipat on Christmas day (given through Sumit in Delhi on 26th Dec 2010) I was told that, henceforth, it would not be my Saadhna (spiritual practice), but His! This time He showed me how. During the meditation I didn’t exist at all. The Master did. It was only Him -Mohanji. My own entity was one little dot of existence somewhere at a point behind my head. It was only the Master, doing the meditation, receiving the Shaktipat, giving it…. Sadhan, saadhna and saadhya were all Him. During meditation when we were asked to bless all things that have helped us exist on this earth, it was as if I was being told to thank the body that has supported my life on this earth. I had to make some effort to even recognize the body or bless it. The body in fact, was on its own trip. I had got sore legs in the morning. But during meditation, there was complete disconnect with the body and I did not feel pain at all! All that I experienced was that it was simply the Master henceforth. It was so overwhelming to know that there is absolutely no duality in the Master’s words. If He says- “You will know it”,….. gosh, you DO know it…. The Master makes sure you do. Here is one amazing story of my friend. This friend has been on the spiritual path for years. She has been in a virtual sanyaas (renunciation) for years. She gave up her job because she felt that life was passing her by. She never created a family because she never felt the urge to do so. She was a social butterfly before but gradually merged totally into silence and sehaj Samadhi awastha while fulfilling her worldly duties. Her strongest and only remaining bond is the one with Sai Baba. This friend was guided from within to attend this meditation session. Later she shared that a few days back she had started the discipline of asking for purity of heart. Sai says that without complete purity of the heart it is impossible to go further in your evolution. And within days she got to know that the name of the meditation is ‘Power of Purity’. Still, till the last week she wasn’t sure if she would really like to go out of the house and attend a session like this. Two days before the meditation she started getting sure inner signs and tangible proofs that it was simply Sai’s call and nothing else. She attended the session and Sumit could see that her connection was complete. Extreme gratitude and overwhelming thankfulness was what she experienced throughout the session, a state of complete gratefulness and Grace!!! My name is Upasana. I have been initiated by my Guru and have been meditating for quite some time. The moment the breathing exercises before the Power of Purity meditation began, I started feeling very high energy in the body, to the point that I lost control on my emotions. I broke down and cried while doing the exercises, but continued meditating. During the Shaktipat, I felt it was the hand of my own guru blessing me. I felt a lot of heat in my physical body. One thing that surprised me was that, towards the end, the name of a certain guru popped up in head. I had no former thought or remembrance of such a name, nor did I know him before. The name “Adveshanandgiri” surprised me. Mohanji, please accept my gratitude. (Upasana later shared that he found out this name refers to a Guru from a certain lineage). Initially I found myself in a very peaceful place, my favorite retreat- an island. Then, I visualized myself on a Himalayan mountain peak. I naturally tend to meditate on my third eye, so started with that. There were no thoughts in my head although the senses were completely alert. Without any anguish or thought my tears were continuously flowing. I was just being myself, without the body consciousness! After a while, the sound of water in the background got replaced by the sound of the mantra: “Om Namo Shiv Shakti Namo Namah”. I actually saw Lord Shiva! The mantra went on while I meditated. It was a state of total void- Shunya. I could feel that there was a lot of heat in the body. But, inside, I felt total calm……total peace, just like the last lines of the meditation said- Peace and Silence. It was an unforgettable experience. It helped me get an answer which I have been struggling to find for the past few months. It also gave me an opportunity to connect with noble souls, including Sumit himself. 1) I was supposed to be in Bangalore on that day. But I was destined to be part of the Power of Purity meditation. Things moved in such a way that my meeting got cancelled and I landed in Chandigarh that day! It happened against all odds. It seemed that some power was pulling me to come and attend. 2) During the meditation, when I was in the 360 degree bubble, and I was looking at myself, I had my eyes closed. 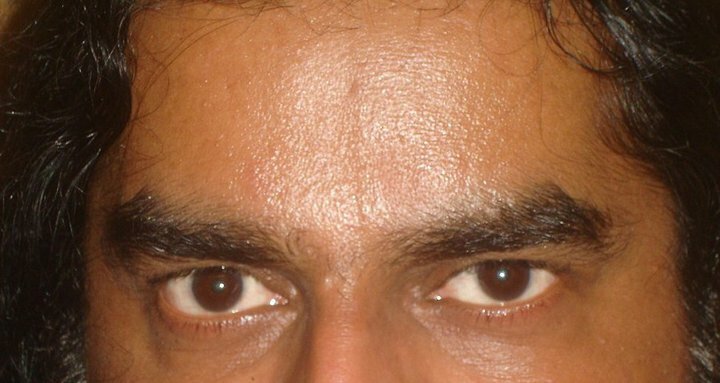 But when I opened them to look at self, I saw Mohanji’s eyes. My eyes were his eyes. It was the very moment that I connected with him!!!. 3) The most incredible part was that I connected with my mother and saw her happy. I lost my mother few months back and have not been able to come out of the loss. I am a spiritual person and am aware of the nuances of mortality, but the loss was too much for me as I was very close to her. I always used to think that mom has become an angel, has privileged powers and will help me always. She is my guardian angel. I realized I was behaving in a selfish manner. During meditation, when I was in a serene land, I saw her happy; but still felt like asking her: “Mom are you happy?” She replied, “Yes I am”. She held my hand and took me around the beautiful place. It had waterfalls, beautiful trees and flowers; serene in its true sense. She used to take me around for rides, when I was a child. I had that same child-like excitement and felt happy, because she was happy. I have got the answer now. She is happy. Thanks Mohanji for making me connect with my mother. 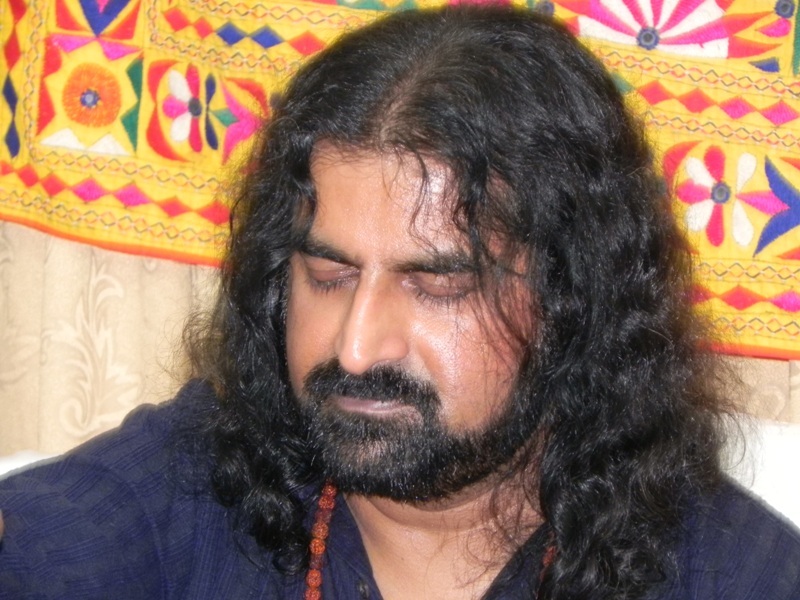 I had a very Divine Experience during the Bless the World/Power of Purity meditation held in Chandigarh on 30th January 2011. It was scheduled to be conducted in two sessions because of the large number of people. I decided to sit in for the first session and told myself I’d consider the second session later. During the Power of Purity meditation, I was not present there in the room – I felt like I was somewhere else. I don’t even know where. Whenever during the meditation I was given Shaktipat, I seemed to feel myself come back. It was like my soul was going and returning, on and off. But at the end of meditation in first session, I felt like there is a hand which is placed half of my head and half on my forehead. I thought it is my thinking or imagination that there is a hand. When I touched my forehead, there was nothing there physically, but again, when I pulled my hand away from the head, I felt the same pressure of hand! I enjoyed the moment of that experience. Later, when people were sharing experiences and Sumit was explaining something to all of us, I was amazed to see that instead of Sumit, there is an energy field of white light in shape of a man and answers were coming through that light. Who else other than Mohanji could that other man be!!! It was as if the conversation was going on with that ‘man of white light’. It was a pure Divine experience for me, and I was so refreshed and energised, that I did not feel like taking rest for the next two days. My deepest thanks to the Divine and the Master Mohanji. My name is Sumita …I am blessed to have been there on Sunday. I totally believe what Sumit said in the end, that when you are ready, the Teacher appears.. and one’s soul knows what he or she wants. Same way, when Aparna told me to make sure that I join the meditation session, I was prepared for it, but just a day before that, I encountered the roughest, most serious block of my life. I don’t want to term it as a devil’s attack or anything, but I do believe that it was my deepest, scariest karma that surfaced just one day before the meditation. My world was coming to pieces….and though my soul knows that I’m ready to face this test, it needed a little more strength to handle the situation. It was a major step for me to make that effort and attend the meditation. When I started the meditation, I never knew what it would be like. I had simply surrendered myself to the moment….. Since the beginning of meditation I started to feel something very different. There were many visions. I saw many different things. I saw green and blue color bubbles and then a white light. I saw Shivji’s aasan (seat) and kamandalu, Ma Kali’s tongue and her side face. I saw Sai Baba, Buddha and experienced lots and lots of energy. I lived every second of that session with great intensity. In the end, I will only say that I was at peace. No matter what goes on on the outside, my inner space is at peace. Before I attended the BTW, I had virtually no connection with Mohanji. I hardly knew about him. But when a friend told me about the meditation session in Chandigarh, we almost instantly said yes. I was taken aback a little as I didn’t even know the person at whose place the session was to happen. Except for that common friend, I didn’t even know anything about this meditation or Mohanji. Anyhow, we decided to follow the messages and landed up at Chandigarh. This was the first experience for me and throughout the meditation I felt I was in and out of body. Shaktipat used to come clear and strong. During the first Shaktipat, I felt that someone had placed both the hands on my head (Later I was told that it was, in fact, only one hand). The second time I distinctly felt someone’s hand on my third eye (while actually Sumit had touched only my head). The third time of Shaktipat there was Gautam Buddha sitting across from me in a meditative posture and showered many blessings on me. Towards the end I felt lots and lots and lots of love to the point of being overwhelmed. When the meditation ended, I was so emotionally overwhelmed I could hardly talk or even analyze the experience.